New Delhi, Oct 24 (IANS) India on Tuesday told visiting Afghan President Ashraf Ghani that it believes peace efforts in his war-wracked country should be “Afghan-led” and “Afghan-controlled”. 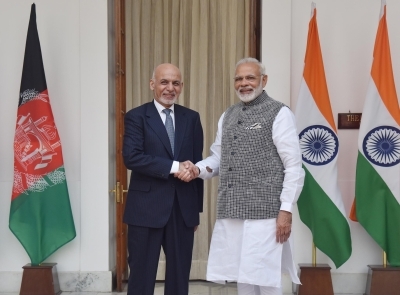 Welcoming the Afghan President to India, President Ram Nath Kovind also condemned the series of terror attacks in his country, including in the provinces of Kabul, Kandahar, Ghazni and Paktia, that have resulted in over 200 people being killed in the past week. 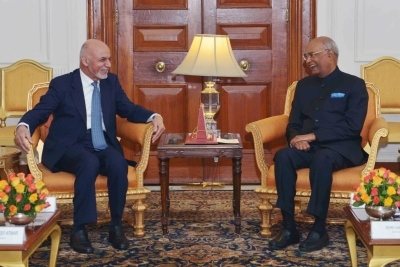 Kovind expressed admiration for the astute leadership that Ghani has provided to Afghanistan through difficult times and commended the Afghan President for strengthening bilateral relations between India and Afghanistan. Kovind added that India itself has been victim of state-sponsored, cross-border terrorism for decades. “We can fully empathise with the ongoing quest of the Afghan people to secure peace. “India believes that whatever initiatives are taken for bringing peace in Afghanistan should be Afghan-led and Afghan-controlled,” he said. His comments come days after Afghanistan participated in the 6th Quadrilateral Coordination Group (QCG) meeting along with the US, China and Pakistan in Muscat, Oman, on October 16 to revive stalled peace talks with the Taliban. On the same day, India’s National Security Advisor Ajit Doval had flown to Kabul to meet with the Afghan leadership. “Securing sustained peace and security remain the key fundamentals in leading Afghanistan on the pathway of economic recovery and growth. Unfortunately, mindless and senseless violence is being imposed on the people of Afghanistan,” President Kovind was quoted as saying in a statement. The President said that for India, Afghanistan is not just a strategic partner, but a nation that evokes endearing affection. He recalled President Ghani’s speech at the Heart of Asia Summit in Amritsar in December 2016, and his visit to the Golden Temple. He added that civilisational links and people-to-people contacts provide a strong foundation to the ever-growing bilateral friendship. Kovind also said that in recent times, the two countries have deepened their strategic partnership. The India-Afghanistan Trade and Investment Show in New Delhi brought the businessmen of both nations together and generated business worth over US$200 million. The President expressed happiness at the opening of the air freight corridor between Kandahar and Kabul and Delhi. He also noted that the Afghan cities of Mazar-e-Sharif and Herat have been connected directly by air to Delhi. The Afghan President is on a day-long visit to New Delhi.